6mmBR.com's first featured pistol is a beautifully crafted XP 100. Proud owner/builder Cayle Davis reports: "Thought you might like to see my latest project here at C & J Machine--my personal XP 100. It's chambered in 22 BR (.250" neck), with a 16" Shilen barrel riding in an aluminum stock I designed and fabricated. 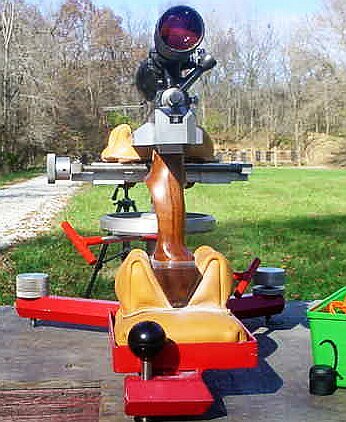 The XP 100 is a tack-driver. It groups in the high 2s to low 3s, sometimes dipping into the low 2s. I love the metal stock--it definitely adds to the gun's accuracy. Weight, all-up, is 12 lbs with a Burris 3-12x scope. My load is 31.5gr of Vihtavuori N135, with a 52gr Barts bullet, Rem 7 1/2 BR primer, in Lapua brass. The XP 100 is sitting on our C & J Convertible Rest, designed for both rifles and pistols. Guess I should start at the beginning as to how the pistol came about. I have been shooting Remington XPs for many years. I think I bought my first one in about 1978 or so, a .221 Fireball. It was ok but left a lot to be desired especially when I started in the Silhouette game. My next one was rebarreled to 7mm-250 and it worked great for the heavy steel rams. But after time, the silhouette interest faded away, so we got into shooting prairie dogs. Time for a barrel--off came the 7mm barrel and on went a used 22BR Shilen barrel. We just took a used HV contour barrel and cut about 2" off the rear then fit and crowned it. We dropped the barreled action into an HS Precision stock and went shooting. Groups at that time were running about 3/8" or so. 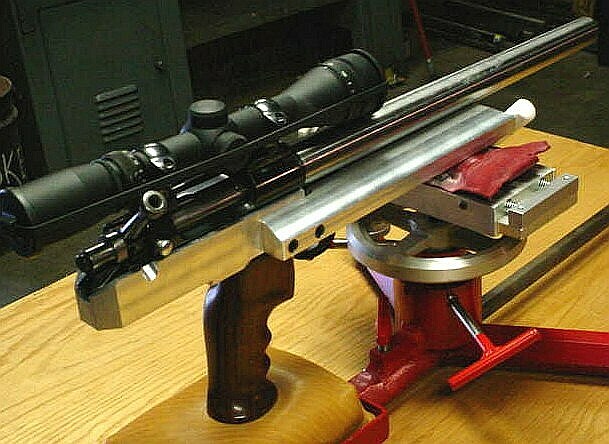 I always wondered how well it would shoot in a really good bench stock but I never did pursue that as no one made a center-grip bench stock to my knowledge. ...this has worked out very well. Groups are averaging in the high 2's and low 3's with one group I shot last Sunday that went .216". WOW is all I can say. Well last winter I was talking with a friend and fellow pistol-shooter. We agreed that when we're shooting pistols the rear bag was always moving after each shot. Seems like you could never get back on target the same way for the next shot. Well we wanted to fix that. So we decided to build a good BR pistol rest. I put together a design from steel. The first rest we made (after much trial and error) worked real well but it was designed strictly for pistols. I sold some of those first-generation pistol rests and folks liked them but some customers wanted a combo pistol/rifle rest so they didn't have to drag two rests to the range. More thinking and testing ensued. After a couple different designs we came up with our Convertible Rest (photo right). I'm surprised someone didn't make one before now, but as always the pistol shooter has been left behind. The new combo rest works great--even better than expected. With the rear bag-holding tray all the way in, it's a short-barreled pistol rest. Just slide the tray out a bit for Contenders and center-grip XPs, and a bit more for the rear-grip XPs and such. Slide it way out for rifles. With the new design, the tray can be removed completely and an adapter slides in to make it a standard rifle rest. The only hitch is you need a windage-adjustable top since the rear bag won't move side to side. So the only way we sell them is with a windage top, which we also build. A New Stock--Why Not Aluminum? Now that we had a good, stable, fully-adjustable rest, we started wondering about just how well that 22br would shoot. Started checking with the stock makers for a bench stock but no luck. There's got to be something better than the HS stock, but if there is I'm not aware of it. Well my buddy says "heck, just make a stock". We sourced some walnut but couldn't figure out the right grip design. I also really wanted something heavier than wood. I ask my friend "how about aluminum?" "Huh?" he replied. Well, after his initial skepticism, we agreed to give it a try. We had a short piece of 1.5" square stock laying around and I sourced a piece of 1"x3" flat bar at work. We're in business. I made the receiver housing out of the 1.5" square section. Then I machined a notch out of the flat bar and bolted it on each side to the receiver unit, with a cut-out for the trigger. So far, so good. But the grip remained a bit of a puzzle. I always liked the 3rd generation grip of the Thompson Contender and had one in the gun cabinet. After some careful inspections of the T/C grip, we decided to change the grip angle and make it more straight up and down. 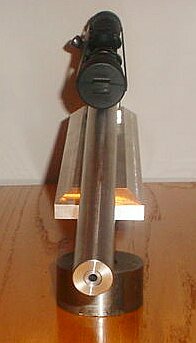 To mount the grip, a block was made that bolted onto the bottom of the receiver housing and the grip attaches to that. We used a Remington 700 trigger guard but when we installed the barreled action the trigger didn't stick through far enough. We had to add 3/4" to the bottom of the trigger to get it far enough down to look right and feel right. That actually turned out well as the longer trigger adds leverage so felt pull is lighter. How Does She Shoot? Like a Dream! So far this has worked out very well. The flat forearm rides the front bag nicely. We did add a V-shaped piece of walnut to the bottom of the grip to slide through the special rabbit ear bags we had made. With that addition, the gun is very stable and tracks really well for a pistol. Groups are averaging in the high 2's and low 3's with one group I shot last Sunday that went .216". WOW is all I can say. As noted above, my preferred load is 31.5gr N135, with Bart's 52gr or Sierra 53gr bullet. The Barts bullets shoot about the same as the Sierras. All loads are thrown from a Redding 3 BR measure. If anyone wishes to chat or inquire about a rest I can be reached at (217) 526-3645 any time before 2pm CST. We have a complete line of rests and bags. P.S. : The rifle on the Convertible Rest is a 6mm BR with Stolle Panda action, Shilen barrel, and Shehane Tracker stock--but that's another story. Copyright © 2004, 6mmBR.com, All Rights Reserved. No reproduction without advanced permission in writing.